About a million taxpayers have opted for a scheme that will benefit small businesses in the goods and services tax (GST) regime by allowing easier compliance and a flat rate of tax. After a muted response initially, interest in the composition scheme has increased. As of August 16, the last date to apply for the scheme, 938,165 entities had registered, against about 100,000 as of July 21, the earlier deadline. In other words, about 11 per cent of GST taxpayers have opted for the composition scheme. 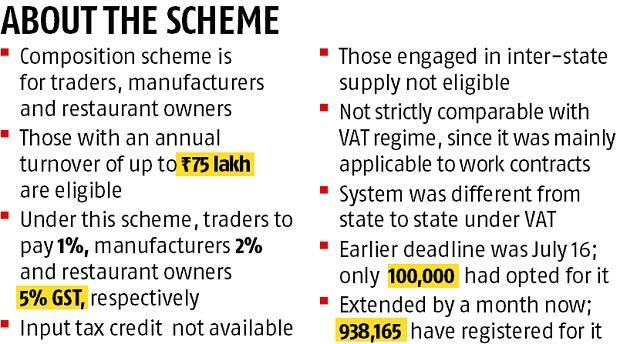 Those with an annual turnover of up to Rs 75 lakh are eligible to apply for the scheme, which allows them to pay one per cent tax if they are traders, two per cent if they are manufacturers and five per cent if they are in the restaurant business. The composition scheme under the value-added tax regime varied from state to state. The eligibility condition for the composition scheme in June was raised to up to Rs 75 lakh annual turnover by the GST Council, from Rs 50 lakh earlier. A dealer registered under the composition scheme is not required to maintain detailed records, which a normal taxpayer will have to keep. Response to the scheme could have been better had the conditions not been this stringent, experts said. Those dealing only in goods can opt for the composition scheme and service providers, barring restaurants, were keep out. Besides, a composition dealer is not allowed to avail input tax credit. Such a dealer cannot issue a tax invoice as well. Thereby, someone buying from a composition dealer will not be able to claim input tax on such goods, limiting the popularity of the scheme. In addition, reverse charge mechanism will not be covered under the scheme. Finance Minister Arun Jaitley and Revenue Secretary Hasmukh Adhia have been claiming that the composition scheme would benefit small businesses, but these entities do not seem to be convinced. But, a composition dealer only needs to furnish one return, GSTR-4, on a quarterly basis and an annual return in form GSTR-9A, against three forms on a monthly basis by a normal taxpayer. Pratik Jain of PwC India said it was difficult to compare and assess the response to the scheme. It would have been better had it also been extended to small service providers. “Besides retailers, it is mostly restaurants that appear to have opted for the scheme as they do not have much of input tax credit to avail,” he said. The composition scheme is not available on inter-state supply of goods. M S Mani of Deloitte said a person supplying to another state needed time to strike a supply deal with a normal taxpayer in his own state who can supply to another state.